This thread describes an observation which requires several adjacent ACIS pointings (i.e. a raster or a grid). It is based on the Cycle 5 SWIRE Survey. The survey consists of nine 70 ks pointings in a 3x3 grid covering 0.6 square degrees in the vicinity of the Lockman Hole. The four ACIS-I chips are used. The layout of the fields is shown schematically in Figure 1. 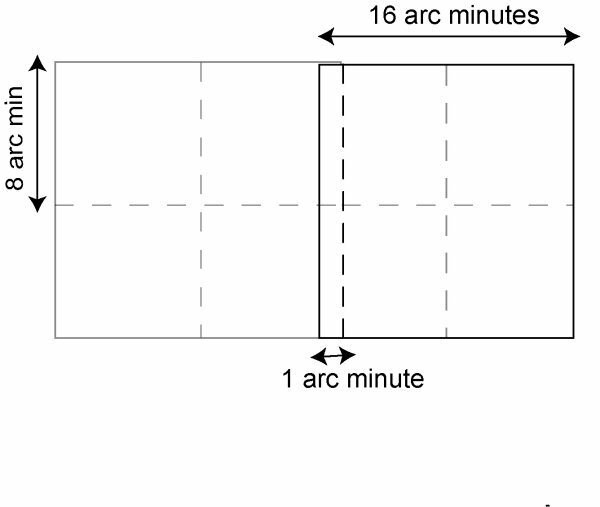 A schematic figure showing the proposed grid layout. It is possible to specify a grid of pointings in RPS with 4 parameters as described below, provided all pointings use identical observing parameters. In this thread, we show how to specify such a grid in RPS. 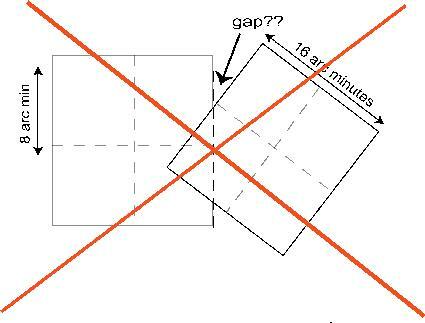 The roll angles of observations in a grid will not necessarily "line up". We also show how to constrain the observations if your science were to require that there are no gaps in the survey. 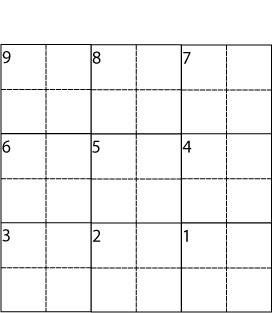 Enter each position as a separate target (time consuming but still viable for a small number of pointings). The use of the term "grid" is slightly misleading in that the survey region can be irregular; it does not need to be a rectangle. Distance from center to farthest grid pointing: 0.59 degrees. Here we take the farthest point to be the diagonal from the survey center to the aimpoint of any "corner" grid pointing. CXC staff will contact PIs of successful grid proposals after the peer review at which time PIs must supply a list of target positions. A "slew tax" of 1.5 ks is routinely added to each observation approved at the Chandra peer review. The slew tax may be reduced for programs consisting of several closely spaced observations. For longer exposures the slew tax formula is equivalent to the default 1.5ks per pointing. The slew tax for this survey is therefore 9x1.5 = 13.5ks. Details of how to calculate slew tax for exposures shorter than 44 ks is given in the Call for Proposals and the Slew Tax Worksheet. The observations in a grid are NOT automatically constrained. In practical terms, this means that that they may scheduled at any time during the cycle. Since the nominal roll of Chandra changes with time, the roll angle of each observation may be different. 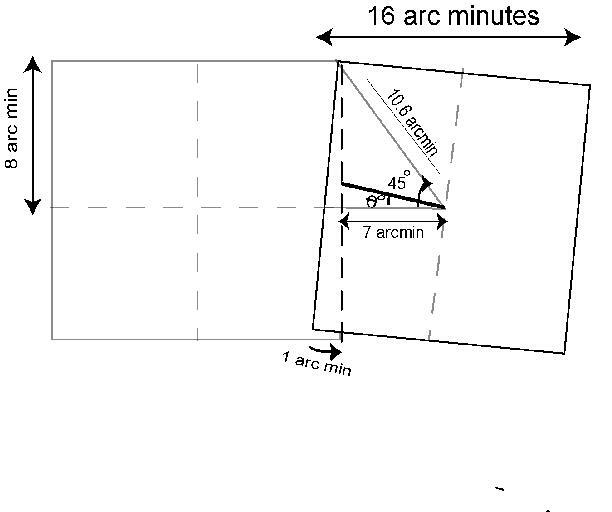 THE ROLL ANGLES WILL NOT LINE UP, as illustrated in the following figure. This will most often lead to gaps in the sky coverage. The "Constraints/Slewtax" tool, accessible from the top of the RPS form, can properly estimate the number and category of constraints that a grid observation will entail. Note that additional constraints or difficulties imposed in the Remarks section cannot be evaluated by this method. The tool will also assess the slew time associated with each pointing in the grid, and give an accurate count of the total time required for your observation. It is important not to have gaps in the coverage of the SWIRE survey. The absolute value of the roll is not important. The maximum acceptable change in roll between two adjacent pointings is illustrated in the following figures. The time interval for the group is 8 days. The total duration of the observations is 70x9 = 630 ks or 7.3 days. The grading parameter is 1.1. According to Table 5.1 of the Call for Proposals, this counts as 9 Difficult observations. Please note that if the exposure time for each observation was 44 ks or less, the number of time constrained observations would be charged at a reduced rate, as described in the Slew Tax Worksheet. Using the SWIRE survey as as example, this thread shows how to plan a grid observation i.e. 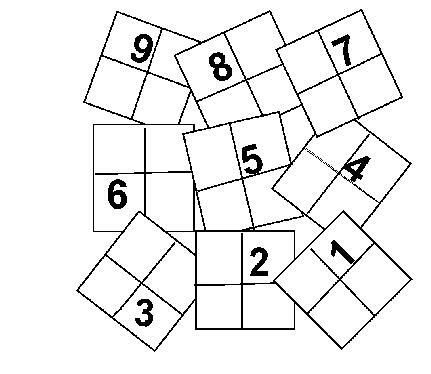 several adjacent or close pointings. Provided your targets have identical observing parameters, it is possible to specify a survey with 4 parameters -- total exposure time (sum of all pointings), coordinates of survey center, number of pointings, and distance of the furthest pointing from the survey center. For the purposes of filling in RPS forms, a "grid" can be an irregular region. If your pointings are not all identical, you will need to enter a separate target form for each pointing. The observations in a grid will not necessarily "line up". This is because the nominal roll angle of Chandra changes with time. Observations done at different times will have different roll angles. If your science demands that the observations "line up", it is necessary to impose a roll or group constraint. A roll or group constraint will limit the time when the observations can be carried out. For the SWIRE survey we calculate the maximum acceptable roll angle change, and use ProVis to evaluate the corresponding group constraint. Finally, we use the grading scheme in the Call for Proposals to determine that the SWIRE survey counts as 9 difficult observations.